Phi Phi Island are located just 45 kms. to the east of Phuket,renowned world wide for their natural scenic beauty. 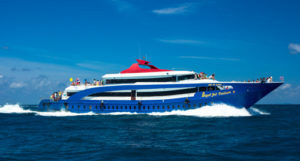 Our newly built vessel ROYAL JET CRUISER takes you from Phuket to Phi Phi Island by comfortable 1.5 hours cruise. 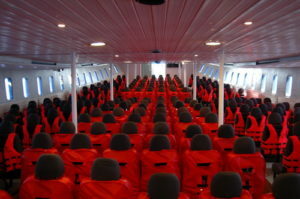 ROYAL JET CRUISER has total capacity of 495 persons on board, separated seats into three classes : Standard Class (300 seats), 1st Class (70 seats) and Premium Class (50 seats). 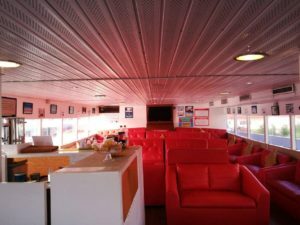 8:30 am Departure for Phi Phi Island by Royal Jet Cruiser 9, large & comfortable boat. 10:40 am Arrival at Phi Phi Ley Island area. 11:15 am Arrival at Phi Phi Don Island. 12:30 pm Buffet Lunch at restaurant on the island. 16:30 Arrival at Phuket Rassada Pier. Transfer to the hotel in Phuket. – Due to National Park’s regulation, customers who do Snorkeling Activity must pay National Park Fee THB 400 /adult, THB 200 /child at local. – Some parts of our tour programs are NOT SUITABLE for Pregnant ladies, Seniors and people who have health problems. – Child age at 4-11 years old. extra charge will be applied on above price. – Layan, Naithon, Maikhao, Ao Poh, Yacht Haven @ PRIVATE BASIS ONLY THB 900 /van/way.